Quantum GIS is an open source GIS desktop software more popularly known as QGIS. QGIS 1.0 was first released in January of 2009 although development on the software began back in 2002 by Gary Sherman with the first versions of the software intended as a GIS data viewer for PostGIS. QGIS is increasingly becoming a viable alternative to commercial GIS desktop software options such as Esri’s ArcGIS suite of GIS software due to its user friendly interface and user support resources including an active presence within the GIS Stack Exchange section. QGIS is a volunteer driven project that is licensed under the GNU General Public License. 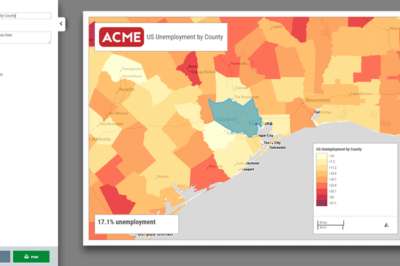 Built using C++, this open source GIS software can be downloaded for free, and runs on Linux, Unix, Mac OSX, and Windows operating systems. QGIS’ has a smaller file size and less RAM and processing requirements as compared to commercial GIS options. Similar to commercial GIS packages that use extensions, QGIS extends its capability through the use of plugins. QGIS also provides access to GRASS’ spatial processing modules through a GUI (graphic user interface). Custom plugins can be created using either C++ or Python. Supported data formats include Esri Shapefiles, PostgreSQL/PostGIS geodatabases, GRASS based vector and raster files, as well as GeoTIFFs. Two versions of QGIS are currently available: a stable build of QGIS 1.7.4 known as Wroclaw and a developer build version 1.9 that provides access to plugins and features still in development but is less stable and buggy. QGIS Library – this is the C++ library that contains the core logic that is used to build the QGIS user interface and other applications. 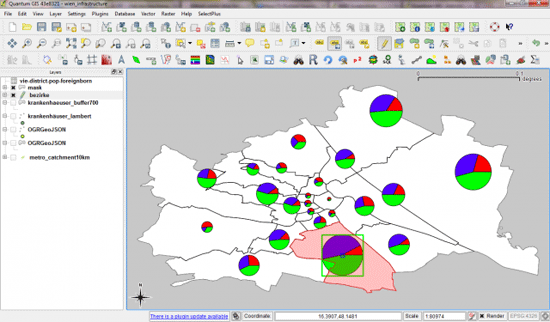 QGIS Application – this is the desktop application that you know and love so much. QGIS Mapserver – this is a server-side application based on the QGIS Library that will serve up your .qgs projects using the WMS protocol. Anita Graser describe the desktop, cloud, and mobile aspects of QGIS in her article, Introducing the Quantum GIS Ecosystem. There are some great resources out there for learning how to use QGIS. The QGIS site has a “How do I do that in QGIS?” section that provides pointers on working with vector and raster databases, spatial analysis, working with different map projections, and making maps using QGIS. Written for those seeking a broad overview on concepts relating to GIS, authors Tim Sutton, Otto Dassau and Marcelle Sutton have produced “A Gentle Introduction to GIS” (PDF format) using QGIS. The text is particularly aimed at educators as each chapters runs through that topic’s concepts, examples and then a “Now you try!” section. The PDF is divided into major conceptual areas of GIS: an introduction, vector data, attribute data, rasterd data, data capture, and more. You can find the individual worksheets, videos, and sample data that complement the text on the linfiniti.com. The document was sponsored by the Chief Directorate: Spatial Planning & Information, Department of Land Affairs, Eastern Cape, South Africa. Anita Graser, the QGIS Community Assistant, has a personal blog called Free and Open Source GIS Ramblings that provides highlights and tips using QGIS. Recent posts include: mapping tree densities in Vienna, Austria using hexagonal grids, OSM styles for QGIS, and a guide to reliefs. There are a host of video based tutorials for QGIS that have been posted to YouTube. QGIS Labs is a set of ten lab assignments complete with sample data that can be self-led in order to learn QGIS. The labs were created by Richard E. Plant from UC Davis and use QGIS version 1.7.3. First, start with the basics. Download the version of QGIS for your operating system and make sure it loads properly. Head over the the documentation section of QGIS and download the user guide. Section 2 of the guide has a sample session complete with a link to download sample data. Run through the steps to familiarize yourself with some of the basics of loading and symbolizing data in QGIS. Also review the tutorials found within the Gentle Introduction booklet mentioned above. Don’t be afraid to experiment. The best way to learn is by trial and error. 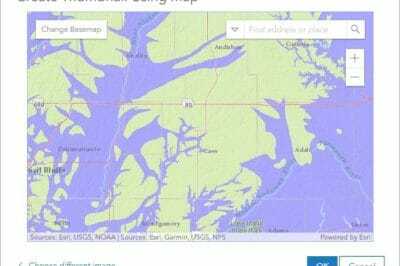 Come up with a mapping project idea that you can use QGIS for. Take advantage of the peer support out there but don’t expect to have your hand held; peer users will help point you in the right direction but they aren’t there to take you step by step through your GIS issues. 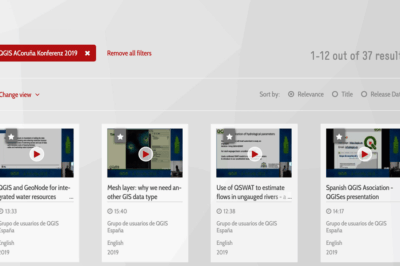 The QGIS forum is a great place to get help if you’re stuck after you’ve consulted the user guide and other online QGIS help documentation.